Meet Paul: The Architectural Technologist making waves in the small business world. 5 years in and many more years to go we introduce you to Paul Cramphorn, the director of Detailed Planning. 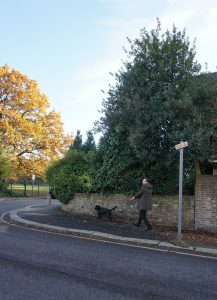 We join him on a dog walk in Golders Green with Winnie the resident office dog to ask what it’s like to run your own business in the Architectural industry. I have always had a passion for architecture, when growing up living in a north London suburb I spent most weekends in London and this only fuelled my love for architecture. I really enjoy mixed styles within buildings and seeing the built environment changing around me through the years. As with most architectural fans I enjoy watching Grand designs and seeing peoples passions/ideas come to life. Alongside my love of Architecture, I have a great interest in art, particularly street art. I love to visit Nelly Duff Gallery on weekends and of course have some of their art hanging in our office. 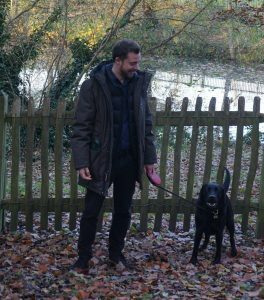 I now reside in North London where I spend time walking our resident office dog Winnie (see above) along the Kings Cross canal. Why did you choose to become an Architectural Technologist? Through my love of architecture I knew this was the industry I wanted to be in. I love to create well designed functional spaces and working on residential homes that impact individuals. This has been a real drive for me. How did you set up Detailed Planning? Tell us the story of how it all began. It all began in a Hertfordshire bedroom and snowballed from there. I founded Detailed Planning with my friend who specialised in surveying and through hard work of 60 hours per week, we made it happen. Our first office was in a bedroom and eventually moved to an upgraded permanent office in North London, to allow for more employees. I really have enjoyed the sense of achievement from the hard work of setting something from nothing and recommend it to anyone that is thinking about starting their own business. I worked I’ve hundreds of projects and take pride in all so I couldn’t say I have a favourite. All projects have come with different challenges and that is what drives me. I like to always beat clients expectations and thrive on seeing how the project has impacted their life for the better. What advice would you give to anyone who wants to work as an Architectural Technologist? It’s important to stay up to date with current regulations and always expand your knowledge. This can be done by attending courses such as CPD lead seminars. Visit a wide variety of buildings, it will spark so many ideas just getting out there. Asking questions throughout by speaking to colleagues or piers. I would also recommend speaking to clients long after their project to learn how they are enjoying the new space. What is your favourite building and architectural style? I enjoy seeing the contrast between old and new buildings and how they relate. I love the kings cross development, especially the converted gas storage buildings. Recently we went on a tour of the new Coal Drops Yard and it was really inspiring. Stay optimistic, work hard while maintaining a balanced life style. Remember to stay well-travelled and celebrate success. Although the hours can be long, appreciate the sense of achievement of creating something your own. For more information on Detailed Planning and the architectural services on offer visit Detailed Planning.